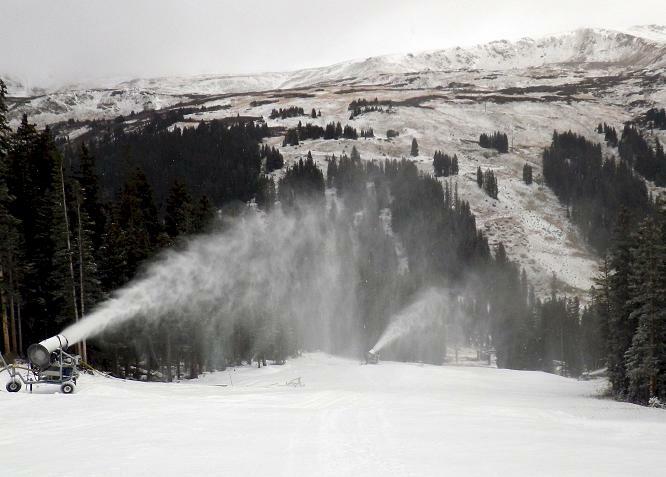 Loveland Ski Area on Wednesday announced it will open for the 2014-15 ski season on Saturday, Nov. 1. The announcement comes a day after two competing resorts — Keystone and Copper Mountain — both postponed their opening days originally scheduled for Friday, Oct. 31. Loveland typically battles Arapahoe Basin to be the first resort to open in Colorado, if not all of North America, but this season had to push back its traditional mid-October opening date. A-Basin has had limited terrain open since Oct. 17. Copper Mountain will open Nov. 7, the same day as Breckenridge and Wolf Creek. Keystone still has not set a new opening day. At Loveland, Chair 1 will run from 8:30 a.m. until 4 p.m. on Saturday and will provide skiers and riders with access to one top-to-bottom run covered tree-to-tree with an 18-inch base. The trails Catwalk, Mambo and Home Run make up the opening day run, which is more than a mile long and nearly 1,000 vertical feet in elevation drop. Loveland Ski Area opened on Oct. 17 last season. Loveland Ski Area will be open seven days a week until closing day in early May. Lift operating hours are 9 a.m. until 4 p.m. on weekdays and 8:30 a.m. until 4 p.m. on weekends and designated holidays. Early season lift tickets are $51 for adults and $25 for children ages 6-14. Go to the Loveland website for more information. Warm, dry weather will persist through Saturday before a cold front brushes the state Sunday into Monday, providing colder temperatures for snowmaking, according to Opensnow.com. Great news and glad to have such a great hill open already. ABasin got out faster, but Loveland can hold its own. Looking forward to an excellent season.